There is nothing better or worse than a theme bar. At their best, they are an alternative universe and an extra escape from reality (as if booze wasn’t enough). At their worst, they’re a plaster for drinks poorly made and concepts badly executed. Thankfully, RIINK falls firmly into the former. 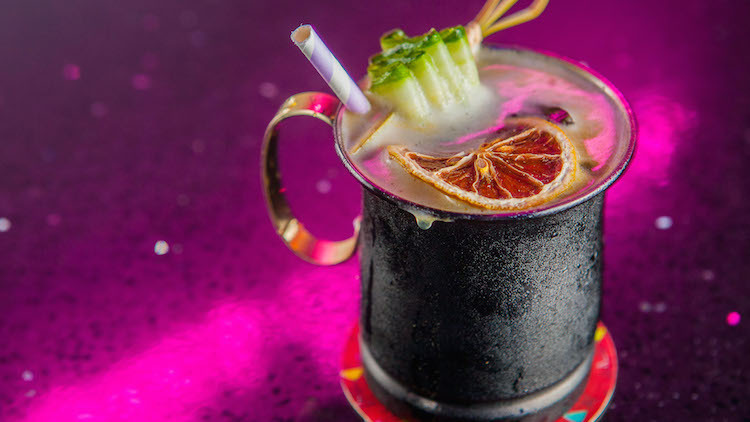 The bar (taking over the space formerly inhabited by metal bar Inferno) raises several questions: who roller skates anymore? Who ever roller skated? Well, you do, now that you’ve strapped on your wheeled shoes and are tottering around the bar to ‘Dancing Queen’. You’ll come here to skate, or at least for the novelty of it and some 100-emoji photos. Unlike most of the patrons, one of the partners, Ting Ting Liang (LBT bar Roxie), actually knows her way around a pair of skates, and generously gives pointers to tipsy skaters blundering about on the small rink. 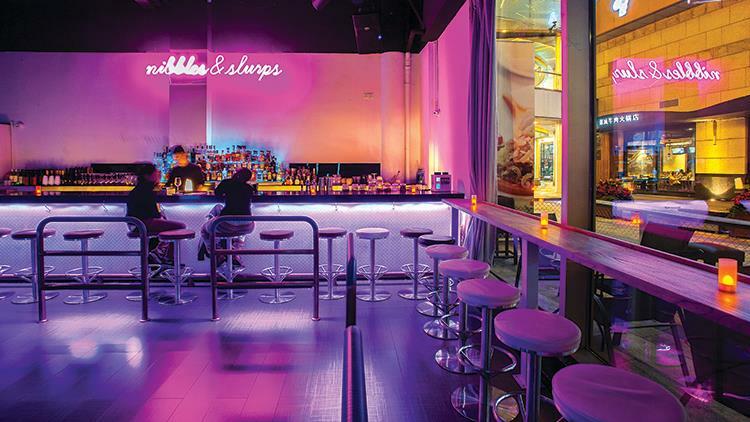 The neon-lit, high-energy bar takes itself seriously for food and drink. Devised by Geo Valdivieso (formerly The Captain and UNÏCO), the cocktail menu features a respectable line-up of adapted classics, like the Abstract Mojito which turns on a rich honey grapefruit truffle syrup, a spicy take on a paloma and the Tikki Riink, which claims cherry-infused cognac and pineapple rum, but mostly just tastes of coconut-oiled Spring Breaks, which you’ll either love or hate. Austin Hu (Diner, among other projects) is behind a small collection of snacks that have been carefully crafted, perhaps too carefully. For 68RMB, the Poke Crisp arrives as a trio of single bites, canapés where you might expect a full bowl. 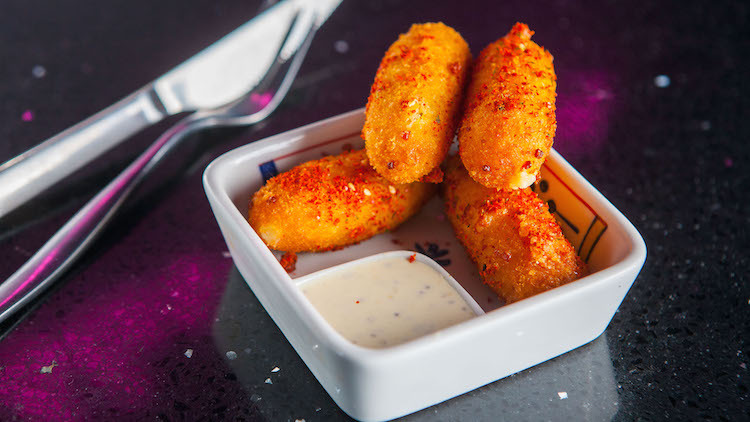 Chicken wing ‘popsicles’ are audibly crispy and delicious – still just a bit fancy if what you came to do is skate, but perfect if you’re there for social media snaps of flashing LED wheels on skates. Serious food aside, the playlist is banging and varied and whether it’s for photos or skating until you’re sweaty, RIINK is just straight-up fun. Skate rental (sizes 35-45 currently offered) runs 45RMB for skates without lights and 50RMB for skates with flashing, LED wheels.